Francis because of his McNeely connection. Burial: Pinegrove, United Cemeteries, Beckwith, Ont. ...... 2 Augustine Lasharity b: 1834 in Village of Old Chelsea, Hull Twp., Quebec. d: Jun 25, 1907 in Village of Old Chelsea, Hull Twp., Quebec. .......... +Catherine Daley b: 1834 in Village of Old Chelsea, Hull Twp., Quebec. Baptism of Susanna, 7 yrs. old, daughter of François Lacharité (99th) and Susan McMeilg? Baptism of Augustin, 2 mos. old, son of Francois Lacharite and Susan McMeilg? spouse and their birthdate but she also includes the name of the spouse's parents. Here is a picture of Francis Lasharity and his granddaughter. If ya wish to publish it put in a caution that the dates may not be correct. have lost her address. Maybe ya might wish to forward this on to her. Thanks to Edie Sage for the following interesting history. Edie has some later details. in the Ashton area, abt. 10 miles from Carleton Place, Ont. operated from Lacharite Landing, and it was also a Flag Stop for the Gatineau train. The name was changed to Kirks Ferry, and still later, to Larrimac. Que., which had been erected between 1840-44. 1	Jane Josephine LACHARITE, b. 1821, in Ontario and d. Feb. 15, 1896. Buried in St. Stephen's Cemetery in Old Chelsea, Que., m. Owen DALY  (also spelled Daily). weaver. She was said to be a very beautiful woman. Family:  (4)   Mary, Kate, James, Jane. 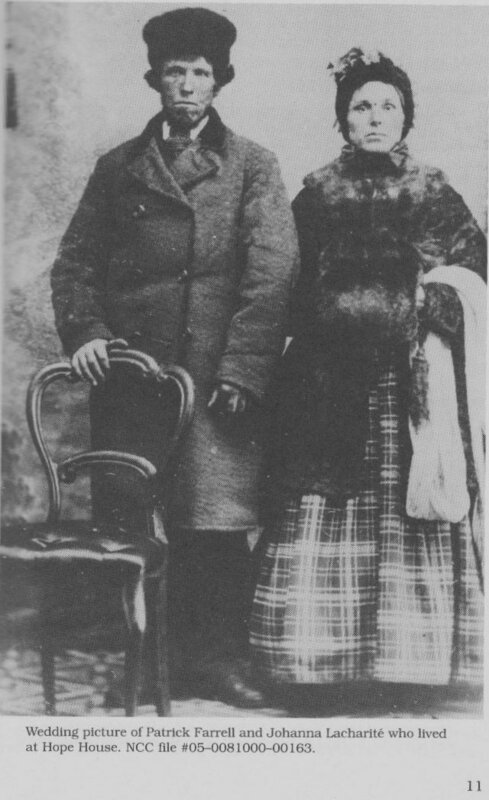 O'ROURKE (farmer) and Mary CAHILL of  Wakefield, Que. Date of m. Sept. 25, 1885 at Wakefield. Family:  (3)  Mary, David, Katie. 2. Patrick David O'ROURKE, b. Jan. 7, 1890, (twin of Katie),  d. Apr. 2, 1908. 3. Katie O'ROURKE, b. Jan. 7, 1890 (twin of David),  d. June 24, 1907.
son of  Pierre FILIAN, a  hotel keeper, and Caroline FORTIER of Quebec City. Date of m. Oct. 17, 1882.
m.  May 11,  1908  at Notre Dame de Grace, Hull. 2. Mary Ann FILIAN, b. Mar. 11, 1890. (3)	James DALY, b. Aug. 29, 1857. Francois m. 2. Miriam (Minnie or Mina) McNEELY, (also spelled McNEILY/McNEALY/McNEALLY). 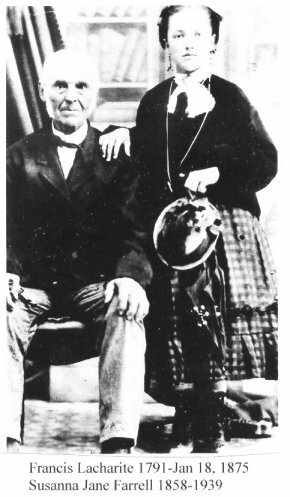 McNEELY and Agnes unknown. buried in St. Stephen's Cemetery, Old Chelsea, Que. his youngest son, Augustine (Austin) and later to Austin's son Owen. Deeded Lot 25 at Meech Lake, by the Crown,  [Cost of the Lot was 23 Pounds:  $92.00]. ceiling, preventing heat-loss from the lower floor in winter. [Thomas (Carbide) WILLSON was later to build  his generating station  on the dam]. close by when she was old). Miriam (Minnie) McNEELY), d. 1914, m. John P. DOUCET, (DUSCET/DUSET) b. 1831, d. July 20, 1875. (2)	John J. DUSCET, b. 1860, d. 1935, m. Elizabeth CONDIE, b. 1866, d. 1938. Lacharite farm on Meech Lake. remained single. She was a competent seamstress and quite a beautiful woman. Buried in St. Stephen's Cemetery, Old Chelsea, Que. in Aylmer. Buried in an Aylmer cemetery. Chelsea, Que. Patrick lived with his sis.,Susanna. and Mary buried at the R.C. cemetery at Wolf Lake, Que. No family. in St. Stephen's Cemetery, Old Chelsea, Que. He remained a bachelor. Chelsea, Que. Buried in St. Stephen's Cemetery, Old Chelsea, Que. Ireland. d. 1962. Date of m. July 18, 1923.
the Military and later served in Government. Date of m. May 18, 1926. Florence and John are buried in St. Stephens Cemetery, Old Chelsea, Que. 1936. Bachelor. Buried in St. Stephen's Cemetery, Old Chelsea, Que. 4. Augustine LACHARITE (4th child of Fancois & 2nd  wife, Miriam McNEELY), b. 1834,  in Old Chelsea, d. June 25, 1907,  m. Catherine (Kate) DALY, b. 1834, d.
owned by their second youngest son, Owen. are buried in Pinegrove United Cemetery, Beckwith, Ont. m. Nov. 8, 1899. John and Hariet were buried in Plot A. 141, Elmwood Cemetery, Perth, Ont.